Ovarian cancer is cancer increasing incidence of ovarian cancer. The need for more effective treatment options and increase adoption of novel drugs is pushing the market towards an extensive growth. The cancer research shows that among all the cancer diseases ovarian cancer holds the maximum share as regards to one of the most common types of cancer among women. It accounts for more deaths than any other cancer of the female reproductive system. Abdominal pressure, urinary incontinence, swelling, loss of appetite, regular changes in bladder habits and lack of energy are some of the early ovarian cancer symptoms. A new study provides a promising result in the development of efficient and advances technology, a rise of new medication and therapies are the rising trends in the global ovarian cancer drugs market treatment. In addition, emerging economies such as China, India, and others, will create new opportunities for the global ovarian cancer drugs market. However, higher cost of the research and patent expiry of several leading drugs, this can act as a restraining factor for the growth of the global ovarian cancer drugs market. The Ovarian Cancer Drug market is segmented geographically into North America, Europe, Asia Pacific, and LAMEA. North America is the leading major revenue generating share region, mainly due to the prevalence of ovarian cancer. For controlling the growth of grasses in the forest, increasing demand from the forest division is also expected to fuel demand for Ovarian Cancer Drugs the market. The Global Ovarian Cancer Drugs Market is segmented on the basis of cancer type, treatment, drugs and value and volume of Ovarian Cancer Drugs submarkets regional outlook. The Ovarian Cancer Drugs industry report also identifies market size in for the year 2018 and forecast of the same for the year 2023. 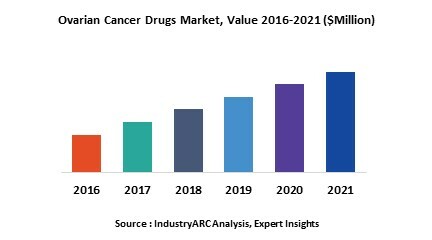 It also highlights the in-depth analysis towards the potential growth opportunities in the coming years, while also reviewing the market drivers, restraints, growth indicators, challenges, market dynamics, competitive landscape, and other key aspects with respect to Ovarian Cancer Drugs market. This report on global Ovarian Cancer Drugs is segmented on the basis of Ovarian Cancer Drugs application, end-use industries using Ovarian Cancer Drugs for a wide range of end-use applications and market size in various geographical regions. On the basis of end-use application categories of Ovarian Cancer Drugs, this report is segmented into five major end-use applications. Some of the major end-use applications covered in this report are as follows: By Types [(Epithelial tumor, stromal tumor, and germ cell tumors] and others. This is report has been further segmented into major regions, which includes a detailed analysis of each region such as North America, Europe, Asia-Pacific (APAC) and Rest of the World (RoW) covering all the major country level markets for Ovarian Cancer Drugs in each of the regions.